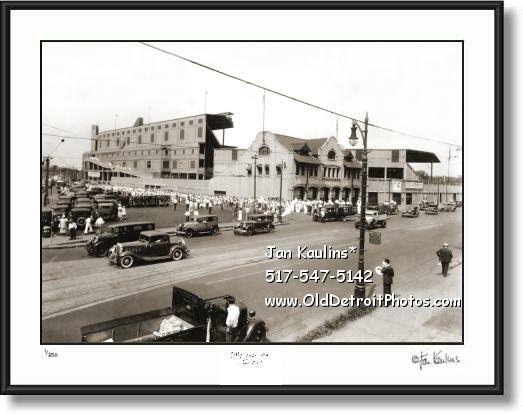 NAVIN FIELD DETROIT photo picture print photograph for sale. NAVIN FIELD 1934 Detroit photograph pictures prints for sale. This NAVIN FIELD Detroit 1934 photo print for sale is made from a professionally restored original oiginal vintage Detroit photo image. We see fans gathering for an afternoon game at the historic Detroit Tigers Baseball Stadium as 1920's and 1930's vehicles drive by. This is a rare and exceptionally fine photo of the early history of Detroit sports and of The Detroit Tigers. "Tigers owner Frank Navin decided that he needed a new steel-and-concrete ballpark to handle the growing popularity of his beloved Detroit Tigers. In the winter of 1911, he had Bennett Park demolished and the Tigers acquired the property from National (now Cochrane) St and Cherry (now Kaline) St. Home plate was moved to the corner of National and Michigan, which consequently moved right field to the corner of Michigan and Trumbull. Navin Field opened on April 20, 1912 with a capacity of 23,000. Due to factors such as the game's rising popularity and the bustling population of Detroit, Navin decided to increase capacity for the 1923 season. During the winter of 1922-23, the grandstands from first to third base were double-decked, increasing capacity to 30,000. The park would remain in this configuration for the next 11 seasons. In 1938 the stadium was renamed after Walter Briggs, the new owner of the Detrooit Tigers. "